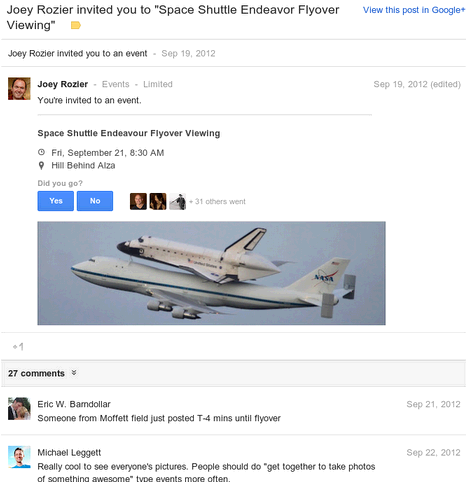 Today one of the Googler ‘Roshni Malani’ announced on Google+ that now Google+ Event notifications will start appearing in Gmail and users will be able to respond to Event invites. As an invitee you can also upload photos , comment and respond to comments on the event page, invite friends and all this can be done while you are in your Gmail Inbox, without opening Google+. Google+ Event notifications appearing in the Gmail will let you RSVP to the Event and you can also check your Google Calendar before responding to the invite. Google+ notifications were already appearing in your Gmail and now integration of Google+ Event is a very good move by Google. Google is one of the first companies to try such interactive features in the email. If you don’t want to receive these notification emails in your Gmail account and prefer to do all the Google+ Event related activities in Google+, then you can disable the Google+ Event notifications in Google+ Settings here. By default above settings are enabled and you can un-check the options to disable the Google+ Event notifications.